What a cute little peeping box-o-chicks! It was early when the post office telephoned to say my chicks had arrived and since I’d been dressed and waiting for their call since 6:00 a.m., I grabbed my keys and darted out the door. I remember clearly walking into my small, rural post office to a choir of ruffled chirping. I don’t know why I expected that they would be silent but at that moment of hearing all that chick-song a full realization of what that “buy-now button” meant hit me full force. 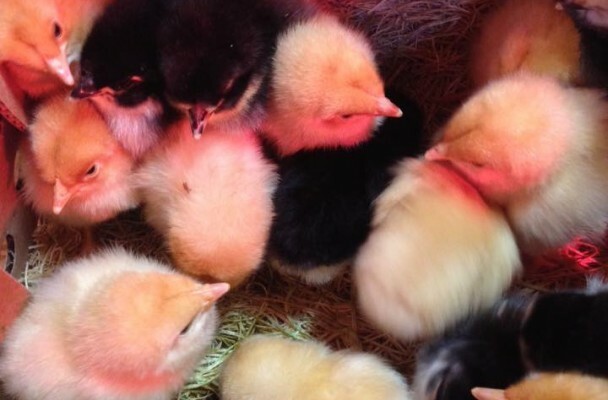 I had just become a mother hen (of sorts) with a little flock of chickens to raise and what I really had at that moment was little box-of-chicks, all fluffy in yellow and black, a little frightened and a little jet-lagged. The box measured about ten inches square. It was hard to believe sixteen chicks could fit into a box that size and finding every chick alive when I opened the box was a great relief. An instruction sheet accompanied the shipment detailing how I would need to show each chick how and where to drink water and where their food could be found. With the tentative hands of a chicken rookie I picked up each chick one-by-one inspecting, dipping beaks and tending like a mother hen. Gosh they were cute. I spent most of the day sitting on an old milking stool watching them run around the coop stretching, flapping and scratching with their instincts in full view at just two days old. Amazing really! Of course, every story has some dark cloud and my chicken tale would be no different for the very next evening when I discovered one of the Black Australorp chicks had died I was devastated. I tried to reason and place blame (on myself, of course) but sometimes there is no blame to place. The truth is that the trip – being shipped in a box from Iowa to Upstate New York is harder on some chicks than others – and some don’t survive. Nonetheless I felt awful and responsible and called my sister crying about the loss. Every little life matters to me and this little unnamed chick’s life mattered too. So now just two days in I was down one to: four Black Australorp hens not five; nine Buff Orpington hens; one Buff Orp rooster; and one free bird of unknown distinction.